1 Snap off or trim the woody base of each asparagus stalk and peel away any coarse skin (although young British asparagus, which is around right now, shouldn’t have any). 2 Bring about 6cm water to the boil in a saucepan in which the asparagus can fit standing up, or prepare an asparagus steamer. Cook the asparagus in the steamer. Or, if using a saucepan, cook it in a bunch with the base in the water and the rest propped up against the side, covering with a lid, until tender. The amount of time it takes depends on the thickness of the asparagus. It can be anything from 5-8 minutes. Check how tender the stalks are with the tip of a sharp knife. 3 While the asparagus is cooking put the crab in a bowl with the lemon juice and seasoning, to taste. 4 Melt the butter in a large frying pan. Carefully pat the asparagus dry with kitchen paper, so the spears just have a little moisture clinging to them, and toss in the butter. Season. 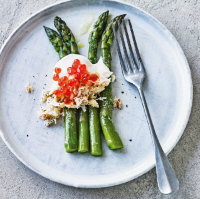 Divide the buttery asparagus between 6 plates, add a spoonful of crab and one of crème fraîche to each plate. Spoon over the caviar and serve immediately. This recipe was first published in Thu May 31 09:42:53 BST 2018.